Get some what? Compliments on your cooking, of course! 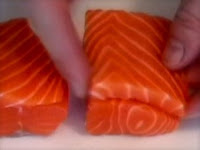 This video recipe shows a new salmon technique I've been using lately, where the moist, fatty salmon belly portion is used to top the thicker, leaner part of the filet. 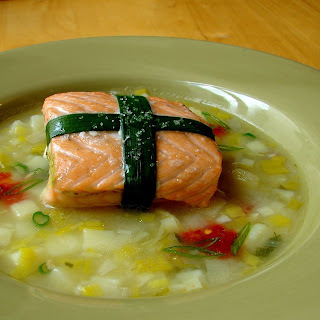 This really produces a fantastic piece of salmon, and when paired with a simple potato and leek chowder, would make a terrific Valentine's dinner idea. You can tell this was designed for some kind of special occasion by the green onion ties. I normally avoid such contrivances, but when done in the context of cooking a Valentine's meal for the object of your affection (also, the object of your affectation), it seems very appropriate. The fact that you (seemingly) went through so much extra effort will convey a certain something about your other talents and abilities. This is not a recipe for beginners. Having stated that, I will say that there's no good reason why this will not work even if you are a novice cook. The key is to watch the video 6 or 7 times, take a few notes, and secretly practice it before the main event. It doesn’t get any better than being able to do a home cooked meal for your Valentine. Think of the savings, the privacy, and what many bachelors call the "home field advantage." But, there are a few things to consider to maximize the experience. Find out about any food allergies beforehand. A trip to the emergency room will not impress your date or her grotesquely swollen face. Also, no scented candles! This salmon recipe isn’t as good when eaten in a room that smells like "Lavender Rain." Lastly, if things seem to be going well, about halfway through dessert, lean over and say, "Would you like to put in your breakfast order now?" If she smiles shyly you know you're in business - if she gets insulted and leaves, you get to finish her dessert - it's a win, win. Enjoy! 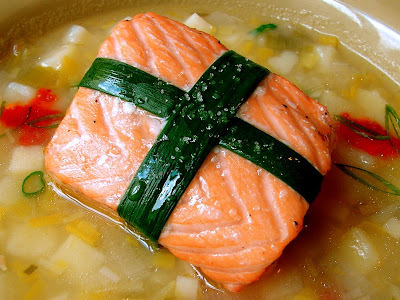 Have you seen these other great salmon video recipes? For information on keeping your knives as sharp as mine, check out this video clip entitled, Knife Steels 101 - Let's Get Something Straight.